Had the non-bose set up in my base 2002 Deville and decided to upgrade to JVC AVX720. This is the first time I had ran into the need for a specialty adapter like the GMOS-06 and it took me for a spin. Once i figured out what i needed, i realized that the GMOS-06 is supposed to plug into the stock harness on one end and my head unit on the other. On the HU side, I needed to plug 4 RCA cables into the back of my HU. The problem being is the HU had rear only (2 channels) instead of front and rear. 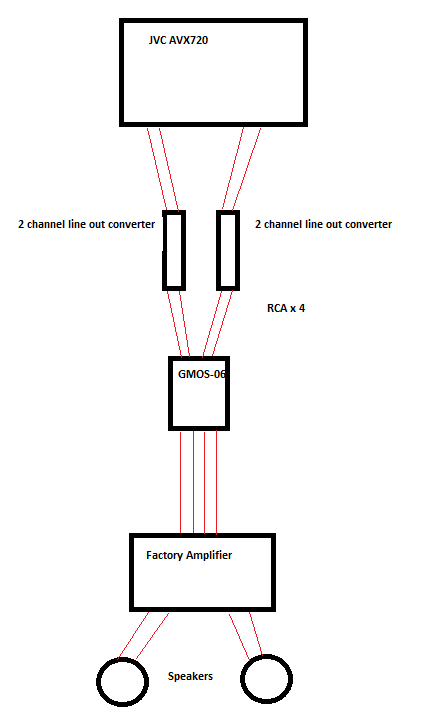 So I decided to get two line out converters (2 channel each) and run them between the HU's powered speaker wire, to RCA then run the RCA to the GMOS-06. To my surprise it worked........sort of. I'm happy with the sound quality but it drops out for about 2-4 seconds at complete random times. It seems like when it happens, it will happen a few times in a very short while then it wont happen for hours. I'm not sure where to start, does anyone have any ideas? I've thought about hooking a single speaker directly up to the HU to see if that speaker would maintain when the others drop. This could rule a few things out i guess. That would bypass the line out converters, the GMOS, and factory amp. Someday Id like to bypass the gmos/factory amp, replace all the 2-ohm speakers with 4 ohm speakers, and leave the GMOS in there to keep the car happy. I could hide a speaker and leave it hooked up somewhere so i could still hear the door/notification chimes. Just not in the cards right now. I dont and wont be using onstar either. Ive attached a horrible graphic of my setup incase my description is found to be a bit confusing. Re: 2002 Deville Factory Radio Replacement "Project"
When the sound drops out look on you DIC and see if a message comes up. Are there any messges that appear on your DIC that come and go? Notice if the sound cuts off when the message appears, because with my car when ever the "Fuel Level Low" or other messages appear, the sound seems to fade/decrease volume for a couple seconds then come back and repeat until I put gas, etc. You should NEVER run with low fuel level in your tank, you know the gas is used to cool the fuel pump. Also that "Sevice stability sys" message is not good either. 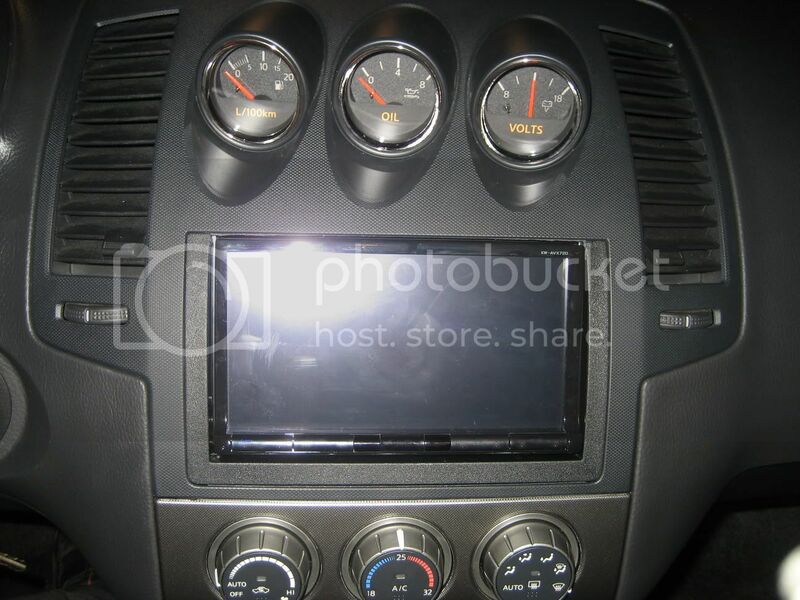 You would have been better of with the Denso OEM navigation unit. Oh, I never knew that! The "Service Stability Sys" comes and goes every few months for some reason as well. Pull codes from dic. I would bet steering wheel position sensor for service stability system. rather than using the two LOC's why not try using two sets of "y" splitters? if you have loc's in line before the amp, that could be part of your problem. tyma1026, tyma1026, tyma1026 and 1 others like this. I have a JVC KW-XR610 (double DIN, CD/USB) deck - and only experienced that symptom when the head unit was getting ready to go into protect mode. Changing the ground to a spot closer to the deck solved that for me. The adapter harness (I have the Metra unit) runs the ground all the way back to the antenna, along with the speaker and antenna wires. Your install from the diagram looks good (you may want to install ground loop isolators, which are RCA in/out). Try grounding the deck to a spot close to the deck itself, and it might not be subject to the dropouts you're experiencing. When installing a aftermarket receiver do you need the metra unit? will it make any difference if i dont have it installed? The metra harness does several things, it retains your key and headlight chime ( chime that reminds you lights are on, or key is in ignition ) and also your back up sensors if you have them. The 3 lights above the rear window will still work if you bypass the metra harness, but you will lose your chime. More importantly it gives you a switched 12volt wire since their is not one there from the factory. you can bypass it all together by just using a standard gm harness, and running an (fused) ignition wire from the ignition harness. I used the grmc-03 for mine, because it has an external chime box rather than using the factory speaker for a chime, so it does not cut out my speaker when it chimes, but also due to me bypassing the factory amps and using an aftermarket amp so without that gmrc-03 i would have lost the chime regardless. if you plan to keep the factory amp and are just replacing the head unit, you can use the gmos-06. hope that helps you out a little bit. you metioned you used the grmc-03 to retain your factory chimes. I have a 2003 Deville DHS with the bose system, and i am doing a full aftermarket setup, ditching the factory amp and using aftermarket amps and speakers. Will the gmos-3 retain ALL factory chimes, including the DIC chimes, reverse parking assist chimes, and others? will i retain onstar and all the other jazz?